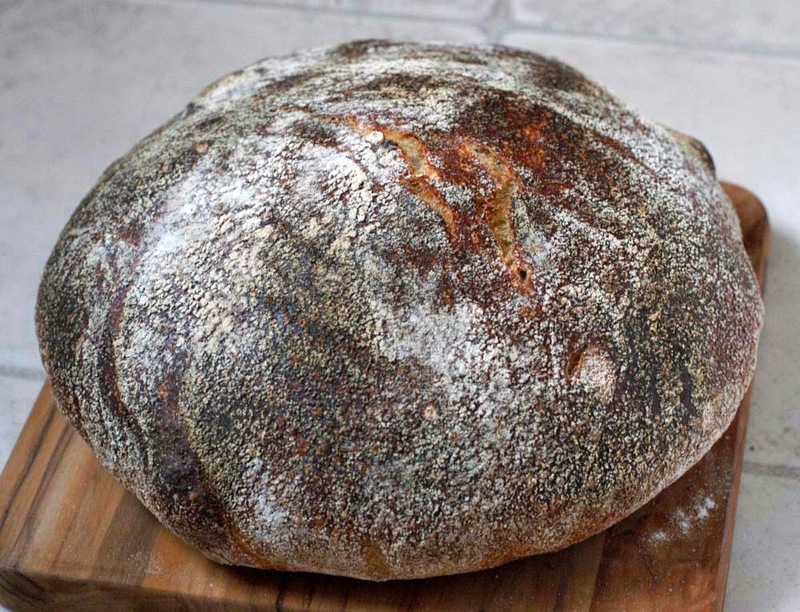 Today I baked another bread from Ken Forkish's Flour Water Salt Yeast - this time Double-Fed Sweet Levain Bread. This recipe calls for an unusual method using two-staged levains, each of which is supposed to be fed in a rather short (3-4 hours) interval. 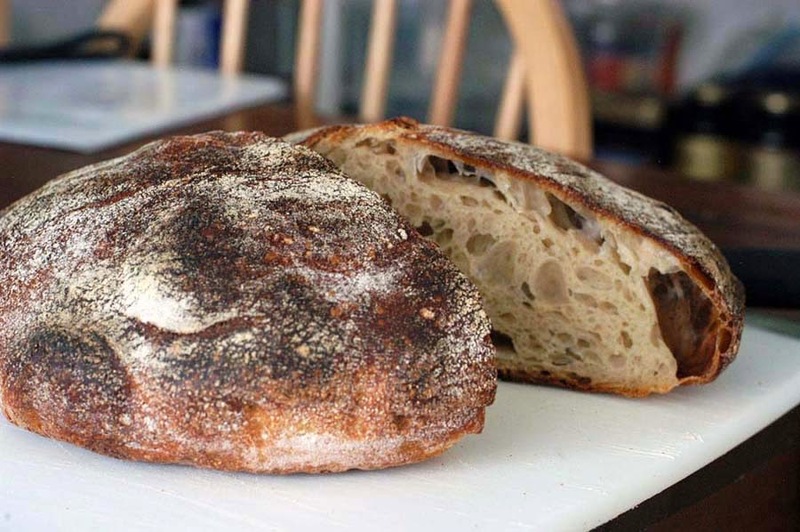 The purpose of double-feeding is to build a fairly young levain that does not produce so much sourness. 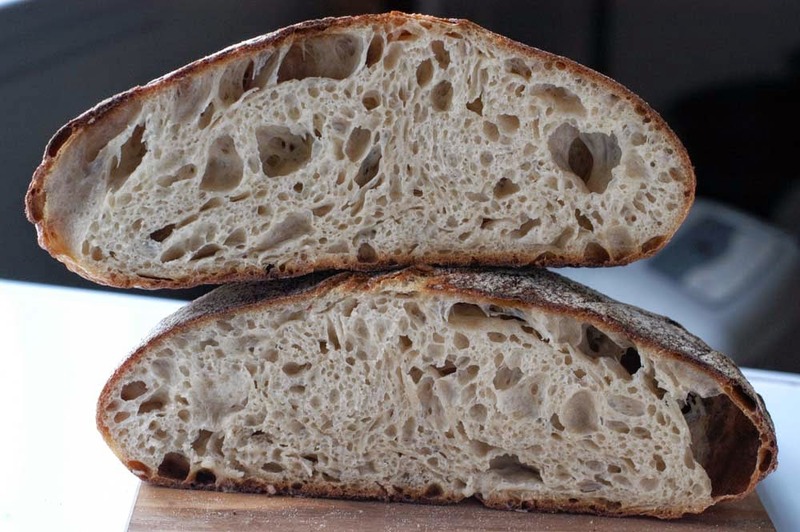 Meanwhile, the amount of levain to be used in the dough is 270g per one loaf, which is more than double amount of the levain in other recipes like Field Blend #2. 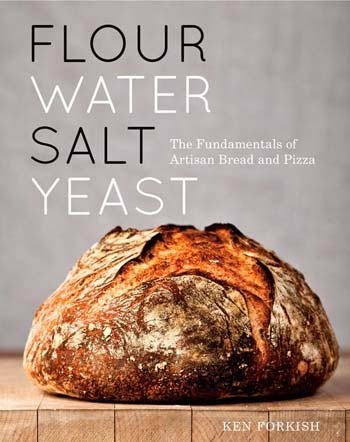 By mixing the less active levain into the dough, the bread is supposed to develop a mild sweet flavor during the bulk fermentation, while the larger amount of levain will boost up the fermentation without slowing it down too much. Bulk fermentation was 5 hours and 10 minutes until the dough rose to double. The room temperature was 76-78F, a warm spring day. 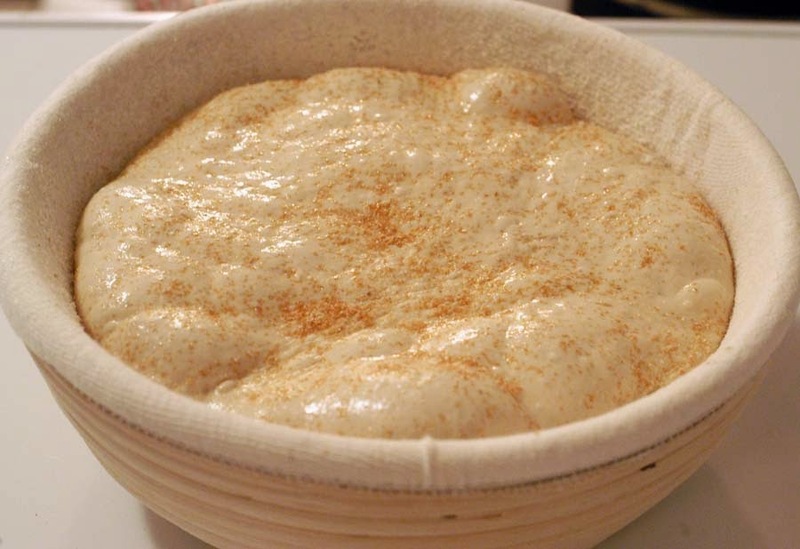 The dough temperature after the final mix was 79F, and ended at 75F. I gave the dough 4 foldings during the initial 2 hours of bulk fermentation. Normally I shape the final loaf rather tightly to produce good tension on the surface, but this time I tried to shape it with extra loose handling, so the gases trapped inside the loaf would not escape so much. 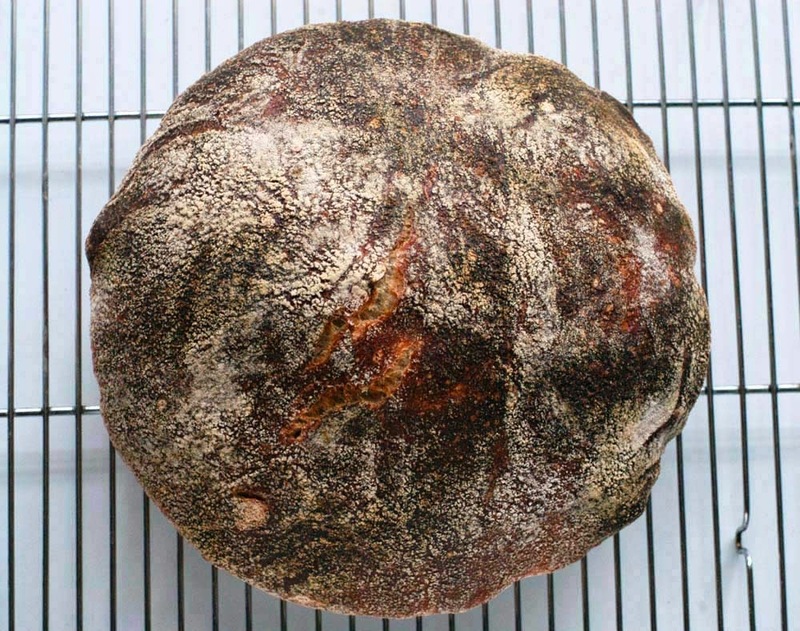 The dough was very bubbly at this point, perhaps since it contained a larger amount of levain than other recipes. After gentle shaping with extra care, the shaped loaf was softer, lighter and bigger than my previous shaped loaves. When I placed the loaf in a proofing basket, it almost looked like the final rise was done. I was worrying whether the loaf might be over-proofed this time, since the weather was much warmer in the last couple of days, and my refrigerator tends to be less cold on such warm days. So I decided to bake it 8 hours after resting in the refrigerator, though the recipe instructed 12-14 hours. The proofed loaf was bubblier than my usual loaves, like ciabatta dough. 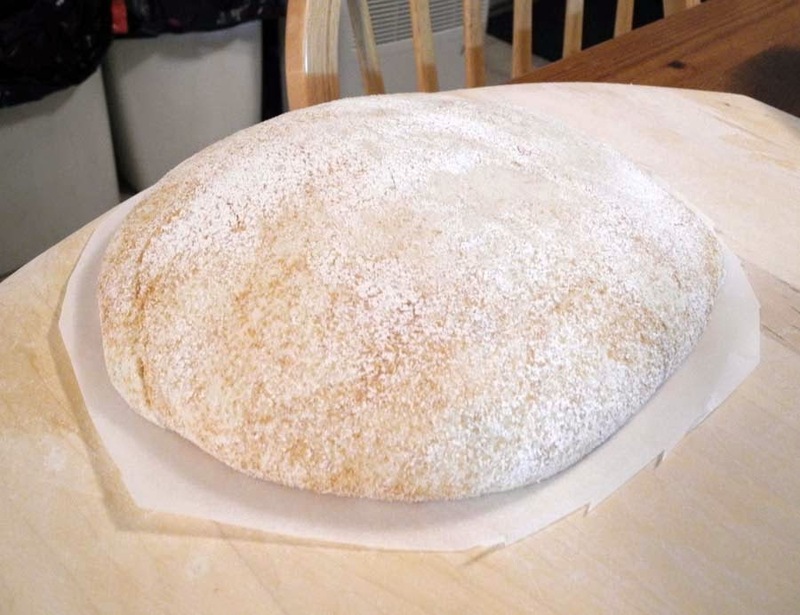 The resulted bread did not have a dramatic oven spring with wide cracks like my previous Forkish breads, but it felt extra light and puffy with a lot of air inside this time, so I had a good feeling. 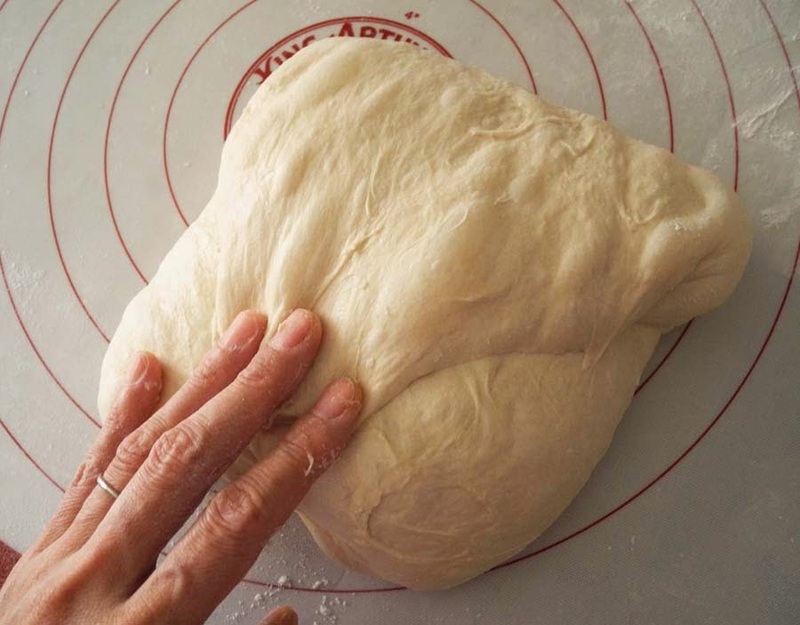 Since I did not add as much tension to the surface of the dough this time as I usually do, the dough might not have had enough tension to expand to make a large crack. Also, a loosely shaped loaf tends to ferment faster than a tightly shaped loaf, so my loaf could be a little bit over-fermented this time (also due to the warmer temperature in the refrigerator). 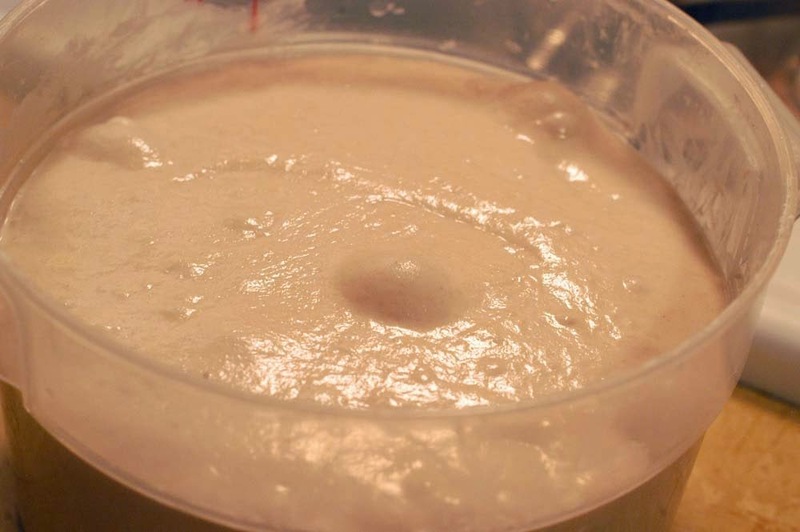 Another possible factor was that since the recipe used a larger amount of levain (almost double the other recipes), the bulk fermentation proceeded faster than usual, so the dough ended up to be over-fermented in 5 hours. Considering these reasons, I will try to keep my eyes on the dough condition more keenly during the bulk fermentation (which should be shorter) next time. Both or either could be the reason why it did not have a dramatic oven spring. I will try to shape the final loaf a little more tightly with more tension next time. This balance between 'try to keep the gases trapped inside with gentle handling' and 'shape the loaf with medium-strong tension' is very tricky, but seems to be the crucial point for getting good oven spring and nice open crumbs at the same time. Another possible reason is that I omitted the small amount of instant yeast that the recipe calls for. 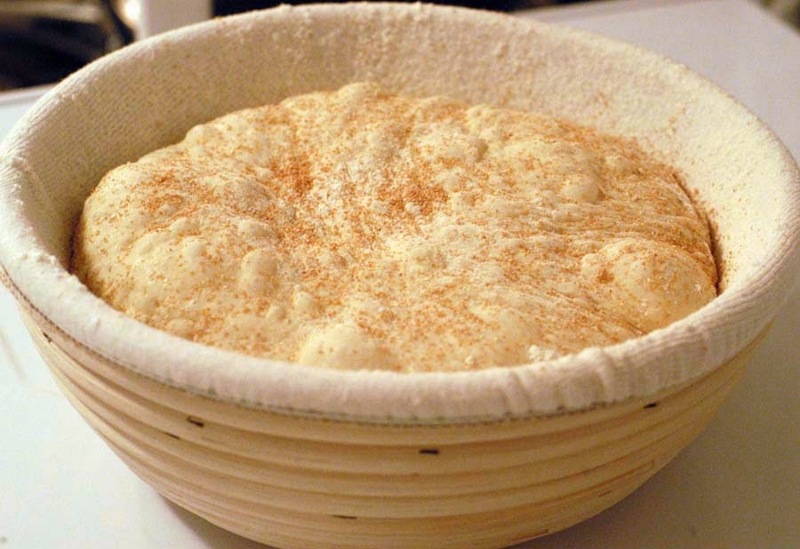 I will try to use instant yeast by following the recipe sometime, to see how it would affect the oven spring. But texture-wise, loose shaping definitely seemed to help to make it the ideal airy bread I was aiming at. 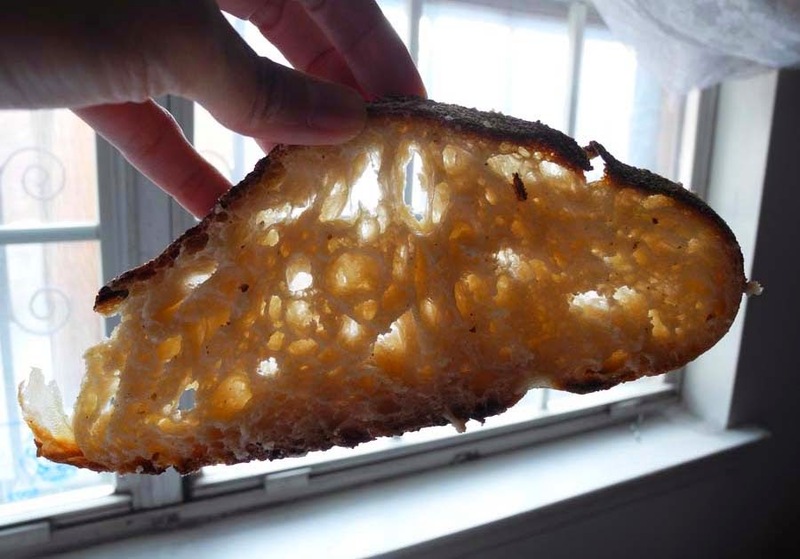 The crumb is very light and soft like an elastic sponge (so it was really hard to slice), with irregular large holes, which reminded me of the bread that we used to get from Sullivan Street Bakery. The crust was very thin and crisp, giving off a deep roasted smell. The sweet aroma during baking this loaf was intoxicating. The natural sweetness was fully extracted from the flours and melded into the mild taste of the resulting loaf with a slight hint of tangy aftertaste. 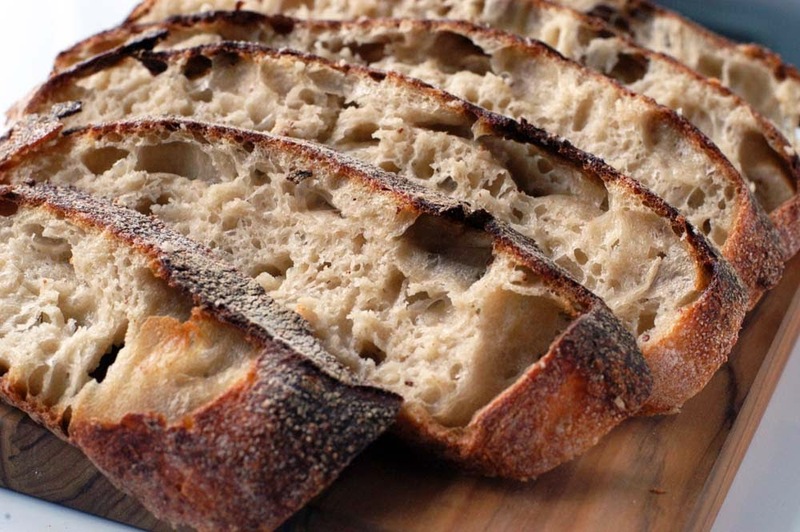 Unlike the bland taste of most white breads which contain a small percentage of whole grains, this bread has surprisingly rich, deep complex flavors, even though it contained only 10% whole wheat. I attribute this to the slow, long fermentation process. Even though it did not have a dramatic crack this time, I am very happy with the result. 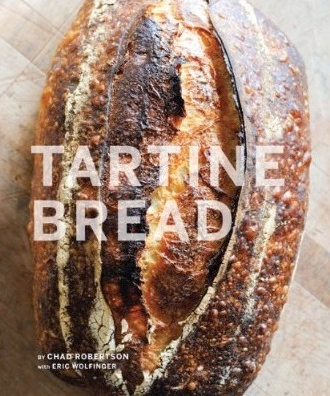 This is another fantastic recipe from Forkish's book, highly recommended. Looks great, Yuko! 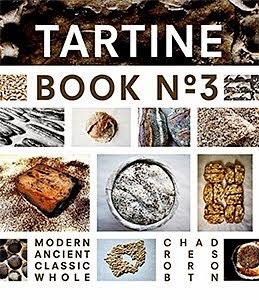 Do you think the rise was less pronounced also because of the longer bulk and increased levain? I've noticed I do get less oven spring when fermentation has gone on too long or I have a higher percentage of levain in my dough (also speeding up fermentation). The final product looks spectacular, I love the look of the crumb -- almost a custard look to it. I'll have to try this recipe by Ken, I haven't just yet.